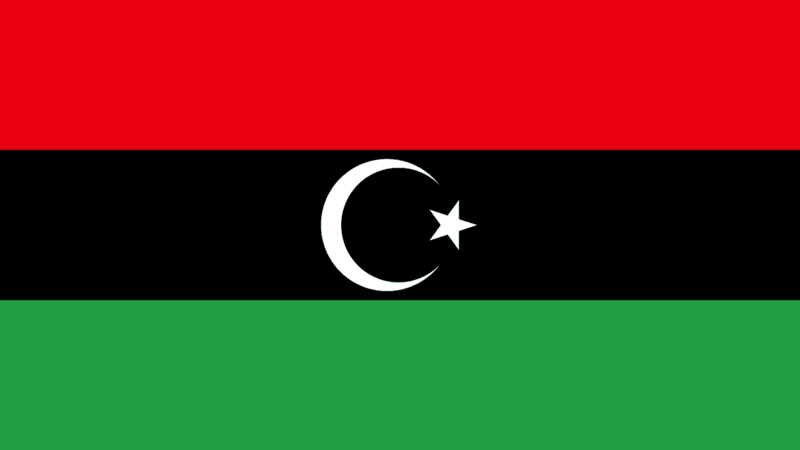 Libya is currently under going a civil war and revolution, with the leader, Muammar al-Gaddafi sending the armed forces out against his people. I have looked at the Gaddafi horoscope and things don’t look good, he should fall. Now to the nations horoscope. Libyan independence was formally declared at a ceremony in Manar Palace, Benghazi on 24 December 1951 *. I could not find the time of the signing so the horoscope is set for noon. Jupiter in the mundane horoscope represent the prosperity of the nation, and this year Pluto is square the Libyan Jupiter, tests and challenged, major upheaval and transformations. Pluto is destruction, and if the oil wells are sabotaged as Gaddafi has ordered, that will certainly ruin the prosperity of the nation. Jupiter also rules religion and the clergy, and we have seen that the religious leaders distance themselves from Gadaffi. The Sun in the mundane horoscope represents the leader, Gaddafi. Uranus is square the Libya Sun this year. Uranus rules revolution and change, so the square presents tests and challenges to Gaddafi from the civil unrest. This transit is just starting now, and will continue through 2011. The revolution from the Uranus transit intensified for Gaddafi because the January solar eclipse was directly opposite the Libyan Uranus. You can see in the chart the Saturn is square Uranus, so the nations does already face a struggle of freedom versus control. Transiting Saturn is now square the Libyan Uranus, exact in early April. On top of all this, Libya is experiencing it’s Saturn return, exact in March. Jupiter as I mentioned rules prosperity, but also the hopes and wishes for the future. Libya had it’s Jupiter return on February 21, the starting date of the full-scale revolt. It is difficult to see Gaddafi holding on much longer with transiting Jupiter opposite the Libyan Saturn, and square her Uranus in March. * Libya: the struggle for survival, Geoffrey Leslie Simons, 1993, p.154. jupiter & saturn return Libyans must be feeling their oats! What frustrates about saturn in libra and libra in general is how much is put up with until scales are tipped. Libra moon will incarcerate itself in awful relationships then suddenly want to rid themselves. Early jupiter/aries wants todo right and believes it is right! Also adding frustration would be Mars conjunct Saturn. Thanks for the info around Jupiter. I hope and pray for the people. I hope that there is revolt from those ordered to destroy the oil wells. I hope the clergy preach that surrender in Islam is as in all other religions surrender to God and not to a man (be it male or female). I pray for the suffering to stop and for everyone to be happy and able to live out there lives in a more normal and just situation. I have both Saturn and Uranus in my first house. This can make me interesting but also a bit erratic. But also with a sense of what is correct and what is not. My most influential set-up according to my natal chart is Uranus in Taurus sextant Cancer in Pluto. Somehow I have survived till now age 67. Jamie I enjoy reading you and what is on this site regularly. As soon as I chose the fix stars as astrology that made sense I found you. So called sidereal astrology explained to me what I have been contending with in my spirit this life. It also showed me that I was fortunate enough to make some good choices and found the higher road to be a more human human being. As I my whole life always believed in the inherent goodness of humanity vis-a-vie the S-P-A. (Socrates-Plato-Aristotle); I understand that change will happen first in the more backwardly developed areas. Not necessarily by a people or a country but by who is the least in tune with cosmic forces, that religious people refer to as Divine Will. Uranus is for freedom, more for liberty and this word takes on even stronger meaning. Uranus also cannot be denied and neither can Pluto when the influences get started. Either ride the wave or get broken. In short- pray for evil to become good. Jamie thanks so much for your reply. I can pick-up on your thought patterns very comfortably and understand that you and your friends have a good “beat” and all the changes taking place. Keep the faith. “change will happen first in the more backwardly developed areas.” That’s a good point, will have to remember that. It does seem that clergy are having some influence on the developments in Libya, don’t think the regime has long to go now. saturn/libra often has wrong people doing right empirical justice and all. Islamic nations want American style freedom…how improbable is that. The problem is my own perception… sympathy is for the underfed street masses, the simple heart felt desire, the anxiety of the next move. That’s where astrology comes in. Will be interesting to see how this Saturn manifests. The Saturn return is exact on 24 March 2011. Hi Jamie – I was looking something else up and noticed there’s an asteroid named Libya (1268), which in Libya’s natal “birth” chart sits on its South Node, forming a tight trine with natal Chiron. When the revolt began on February 18th, transiting Libya was at Aquarius 26, conjunct tMars as well as tSun/Neptune; the people uprising to bring forth an ideal. Currently asteroid Libya is at 0 degrees Pisces, conjunct transiting Chiron (wounding involving Pisces ruled oil) and Urania (Universal love/guidance); these transits are very close to Libya’s North Node, including transiting Karma (3811) at 4 degrees Pisces. I also noticed the transiting North Node was exactly conjunct Libya’s Sun when the revolution began. I think it’s pretty amazing considering Libya’s painful (understatement) attempts to move toward a better future. Hopefully, with the North Node in Pisces, it’s one that involves a surrender to the “Divine Will” jim referred to. The Libyan people have certainly been very courageous in their willingness to sacrifice themselves in order to achieve something greater. These asteroids never cease to amaze me, good work LB. It is all in the name. Also interesting about the North Node is the conjunction to the fixed star Fomalhaut, ” It is said to be very fortunate and powerful and yet to cause malevolence of sublime scope and character, and change from a material to a spiritual form of expression.” Fixed Stars and Constellations in Astrology, Vivian E. Robson, 1923, p.155. Libya is the richest nation in Africa because of the oil, there may be an opening for a more spiritual than material influence when Gaddafi goes. he has made a point about linking the rebellion to Islamic extremism. I just noticed something else. 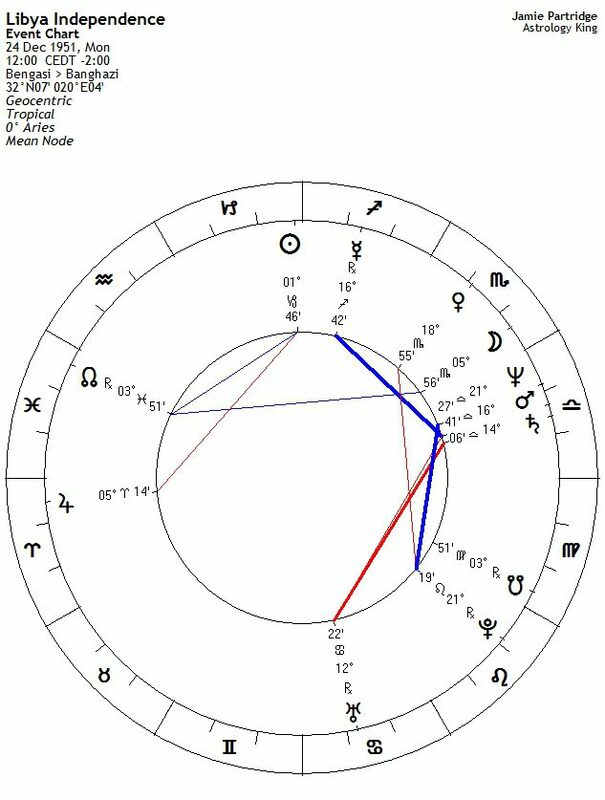 In Libya’s progressed chart, the Sun and Mercury are in the early degrees of Pisces – again, drawing closer to that natal North Node. And the progressed Moon is conjunct progressed Chiron – wounding of the people. I know I’m missing a lot – I’m sure you’d be able to catch even more significant details, Jamie. Anyway, it all seems to go along with what you’ve already written. I haven’t yet read all of the comments on your Gaddafi post – maybe all of this is redundant! You’re more knowledgeable about progression than I am. I just focus on transits. Even with our forecasts for clients, I leave to progressions to Marina. This thread is not redundant. I especially did this one to keep the national chart separate from gaddafi’s. Sure enough, I did miss something. Progressed Jupiter (in Aries) is exactly opposite progressed Saturn (in Libra), mirroring upcoming transits. Not only that, progressed Uranus (in Cancer) is opposite that Chiron/Moon conjunction I mentioned. You are so tactful Jamie (re progressions)! Mercury conj Venus or Mercury in Libra? By the way, everything seems to be coming to a head in Libya’s chart in Aug and early Sep when Saturn touches off the Mars Neptune and Tr Mars touches it off as well. He did a lot of good before also but the methods are quite different from the West for sure. He is himself getting a Saturn sq to his Mars from Sep/Oct for one year. However, I must say the world has been rather unfair to him and Nato attacks inciting civil war was really unnecessary. Thanks, Jamie. Your site and Karen’s former Ravenesque site got me hooked on asteroids. Now I can’t stop. Asteroids are amazing, aren’t they? I love the part about changing to a more spiritual form of expression. I really hope that’s what ultimately happens. Thanks for sharing that. karen is back in business, I’ve put her new site back on our Links Page, Moonlit Serenity. It has the asteroid profiles there on the menu. UN resolution came through 17 March allowing military action against Libya. 17 March Mars square Mercury and Mercury square Uranus, news (Mercury) of war (Mars) flights (Uranus). 21 March Saturn conjunct Saturn, payback time. That’s a big hit on the natal Saturn. The Saturn return coinciding with the major turning point in the sky, the Jupiter Saturn opposition. I think you huys are all really stupid. how can you believe that stars and planets have an influence on what happens on Earth. seriously, its incredibly stupid, Libya did not go to a civil war because of the lining of some planets you fools, it began because the Libyan people were sick of being treated so poorly. Because we live – all of us – even you – in a universe with a unifying energy running through it and it connects everything together. This is why we spend millions on things like large hadron colliders; to try and find out what it is. People put up and shut up with all manner of things until a TRIGGER provokes them to do otherwise. This exists for the one and for the multitude. Ask oyurself why this is happening NOW and not three years ago. Timing is everything, what triggers the event in the time is out there having an effect down here. There are also combinations of triggers with geometry playing a large part. Perhaps if you had the time to learn the art you might see things differently? James Gouldem: I think you huys are all really stupid. how can you believe that stars and planets have an influence on what happens on Earth. seriously, its incredibly stupid, Libya did not go to a civil war because of the lining of some planets you fools, it began because the Libyan people were sick of being treated so poorly. ….you speak for yourself quite eloquently – and the overriding problem with your comment is not that you oppose astrology but that you do nothing else…. libyians treated badly? NATO is a tyrant dressing rebels for a war most don’t want to fight as Gadaffi has pretty much ceded the east. Libyians by chart are people paralized by a cardinal T, allowing easy control by Gadaffi. Try and imagine him winning by’stale-mate’ he has some nodal problems later but this is a gifted guy. (female bias me). Also Gadaffi invested heavily in Europe…they don’t want to repay. Mars conjunct Uranus transit today. August 13 full moon was opposite Liba Pluto. That trouble making star Phecda again! 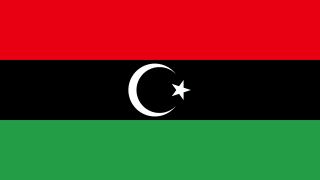 The horoscope for Libya should be done for March 2nd 1977 when the govt the Jamahiriya cam into being. How can one end a govt of the people? Unless they are all dead? As for Muammer turning on his people, this is a myth. He had terrorists sponsored by nato countries turning on his people who are all with him and going beyond, leading themselves. The army is well trained and led by Khamis they take leadership but there is only the rulership of the people. The Jamahiriya is the truly wonderful treasure of Libya that we should all steal and they would love us to do this. Gaddafi is not a bad or harsh man a very noble soul who loves his people and cares for the oppressed and now loves to spend time with his grandchildren we slaughtered. He is a simple man who likes his tent and the desert and feels most at home there. He is a great world leader of the people like Mandela and Gandhi. His revolution in 1969 was bloodless.” years after starting the Jamahiriyah he resigned from the govt having no position save that in the hearts of the people BUT he will always be the leader…of the 1969 revolution.